Twinkle, twinkle no more — now astronomers can see other stars as living, breathing suns. A dome encloses a 1-meter telescope, one of six that make up the CHARA array on Mount Wilson in California. It was 1975. I was a 9-year-old living in Shaker Heights, Ohio, and the cover of the latest issue of Astronomy magazine had just blown my young mind. 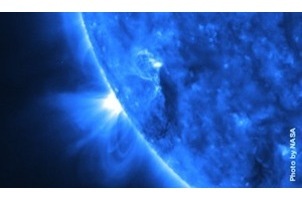 What so captivated me on that day was not one of NASA’s new images of Mercury and Venus. They were spectacular, don’t get me wrong, but this thing on the cover of the magazine was something else entirely. It was a picture of Betelgeuse — a star. It was totally different from a blurry planet made clearer and more detailed by a passing probe. This was a dot of light decoded, a mathematical point that suddenly had dimension and structure and reality. It was almost like magic. I was hooked. I fell into a lifelong obsession with astronomy, eventually becoming the editor of Discover, and waited for more pictures of stars. And waited. And waited some more, for so long that it almost seemed like I had dreamed that astonishing glimpse. These memories came flooding back last spring when I finally saw a new picture of another star, Zeta Andromedae (And). Unlike the crude reconstruction of Betelgeuse, this was a precision portrait of a stellar surface. And it was not just a single still, but a whole series of images knit together into a movie. Frame by frame, I could watch cool, dark spots moving along with Zeta And as it rotated; meanwhile, an even larger spot sat anchored at its visible pole. Nobody had ever seen a distant star with such crystalline clarity. And all of this from a distance of more than a quadrillion miles! At last it will be possible to compare our sun directly with other stars, to put models of stellar evolution to concrete tests, to understand the detailed relationships between alien planets and their suns. So why did it take so long? Roettenbacher’s quick answer is that stars appear exceedingly tiny. Conventional observing techniques still can’t bring them into view, not even close. Consider the case of Betelgeuse, one of the most promising targets for imaging. It is a giant star, one of the night sky’s brightest and nearly 1,000 times the diameter of the sun, but so far away that it appears much smaller in the sky than Pluto. In astronomical terms, its angular size is about 50 milliarcseconds, or about half the size of a single pixel in the best images from the Hubble telescope. Zeta And appears 20 times smaller yet. When Galileo pointed his spyglass to the heavens in 1609, he regarded the stars as dimensionless points of light. Today that is still essentially true, even at the world’s greatest observatories. Starting in the late 1960s, astronomers saw a possible way forward: a technique called speckle imaging that could reach beyond the normal telescopic limits. The idea is to take a series of high-speed snapshots of a star, freezing the blurring effects of Earth’s atmosphere, and then reconstructing the true image from those. Unfortunately, speckle imaging involves a lot of mathematical inference. The Betelgeuse image by Roger Lynds and his team at Kitt Peak National Observatory — the one that got my younger self so worked up — used this technique to show the star’s overall size and shape, but it didn’t reliably capture any specific surface detail. The next giant leap was optical interferometry, merging the light beams from two or more telescopes to create, in effect, a single telescope as large as the distance between the two. The payoff is images hundreds of times as sharp as anything from Hubble. Radio astronomers have used a similar approach for many years, with great success, but light waves are more than a million times smaller than radio waves, meaning optical interferometry requires a million times greater accuracy. Promising experiments in the 1970s soon ran into the limits of the hardware and software of the time, and “anything involving optical interferometry fell out of interest for a while,” Roettenbacher explains. A diagram of the CHARA observatory layout. With little fanfare, though, a few groups of determined researchers kept advancing toward the stars — albeit at an agonizing, incremental pace. Starting in the late 1980s, a collaboration between the U.S. Navy and the Lowell Observatory began developing the Navy Precision Optical Interferometer (NPOI) in Arizona. Around the same time, at Georgia State University’s Center for High Angular Resolution Astronomy (CHARA), astronomer Harold McAlister championed an interferometry machine combining the light from six separate telescopes on California’s Mount Wilson. After 16 years of planning and construction, CHARA finally began full operation in 2001. Soon after, John Monnier at the University of Michigan began work on an instrument called MIRC (Michigan InfraRed Combiner) that could convert the merged light to produce meaningful images. He tested it on the nearby star Altair in 2006, and found that he could clearly see how the star’s rapid rotation whips it up into a roughly egglike shape. Roettenbacher read about the Altair results while she was in college at Ohio Wesleyan University. “I remember thinking, ‘This is the coolest thing ever.’ I was so fascinated that we could [clearly see] stars that aren’t the sun,” she says. At the time, she had no idea that she’d be doing such things herself. But just a few years later she was doing her graduate work at the University of Michigan, slaving away with Monnier to jam beams of light together and zeroing in on Zeta And as the perfect target for a stellar close-up. What Roettenbacher was attempting required a level of precision well beyond what had come before. With interferometry, there is no point-and-shoot. Getting a clear picture of a star would require a tremendous amount of additional, tedious work. Zeta And takes 18 days to rotate, so Roettenbacher had to monitor the star for at least 18 nights, all night long. That was the easy part; then came the data processing. Optical interferometry at CHARA requires collecting the light beams from six different telescopes, sifting through multiple gigabytes of data, and then combining the beams to synthesize the kind of image that otherwise would be possible only with an enormous space telescope. Finally, all the processed data get imported into a software program, developed by Monnier, that translates the lightwave information into a picture. The CHARA observatory layout precisely combines six light sources into one in a long beam lab. Not only could she see starspots (giant signatures of magnetic activity) on its surface, but she noted that they behaved utterly unlike the spots on the sun. Our star has magnetic symmetry between the northern and southern hemispheres, but Zeta And is oddly lopsided, only showing such activity on one side of its equator. “The theory people are still working on it,” Roettenbacher says. The images and movie of Zeta And presage many more stellar visions soon to come. Roettenbacher is about to observe two more stars that are even smaller, more difficult targets. Engineers are currently outfitting NPOI with four giant 1.8-meter telescopes; in upgraded form, it has the capability to provide even sharper views than CHARA. The VLT Interferometer in Chile, operating since 2000 but only now approaching its full potential, has lower resolution but can see much fainter objects. These instruments will scrutinize the disks where planets form around infant stars, and watch the cataclysmic stellar explosions known as novas. But for me, Roettenbacher’s observation of Zeta And is the singular event, the one that transforms our way of looking at the universe. One of the first things Galileo did with his telescope was observe spots on the sun. Now we have seen spots on another star. We have left the last vestiges of the era of astrology and entered the era of aster-ology: the age of stars as physical, tangible and brilliantly visible things.